(LOCATION: Fort Myers FL)To view photos with descriptive captions, look at this boat on our website, World Class Yacht Sales.com. This 49' Gulfstar Aft Cabin Motor Yacht has flybridge, spacious salon, and three staterooms. There's room for everyone. She's a great day boat, sunset cruise boat, and extremely enjoyable for extended cruises with the versatile accommodations to do it all. Starting at the top we have a enclosed flybridge with centerline helm forward with captain’s chair. The well equipped helm features a Garmin chartplotter with integrated radar, two rear facing cameras, two engine room cameras, autopilot, and two VHF radios. There is an L-shaped guest lounge with plenty of room for entertaining. The large aft deck is equipped with a dinghy davit. A staircase takes us below to the salon. The main deck features a full beam salon with teak interior, large windows, and carpeted deck. Furnished with a large settee, two barrel chairs, tables, and flat screen TV there is room to relax or entertain. Sliding doors open to a small cockpit with ladder to swim platform. Wings door provide side deck access. Stairs forward in the salon lead below to the full galley with dinette. The galley features a full size refrigerator with freezer, four burner cooktop, microwave oven, convection oven, and a trash compactor. The dinette has a large L-shaped settee with wood table. The lower deck features three staterooms. The forward VIP stateroom has queen berth, two hanging lockers, and private head access. The forward head compartment has mirrored vanity and a smoked glass shower stall. There is a guest stateroom with convertible sofa, two hanging lockers, and private head with vanity and shower. The separate laundry has washer and dryer. The master aft stateroom has island queen berth, night stands, credenzas, large hanging lockers, settee, flat screen TV, and ensuite head with vanity and shower. This semi-displacement hull 49-footer is powered by twin 435-hp Detroit Diesel engines and is equipped with an Onan 20-kW generator. She has the accommodations and equipment to serve as a weekend getaway, a live-aboard, or an extended cruiser. This yacht is a head turner, a yacht to be proud of when you walk on board. The salon offers room to mingle, relax or utilize the wet bar and ice maker. Sunset on the flybridge is the best seat, unless the sun sets aft where you can view from the aft deck. Call now for more information and to schedule a showing of this Gulfstar Aft Cabin Motor Yacht. United Yacht Sales New Jersey would love to guide you through a personal showing of this 49' Gulfstar 49 Motor Yacht 1987. 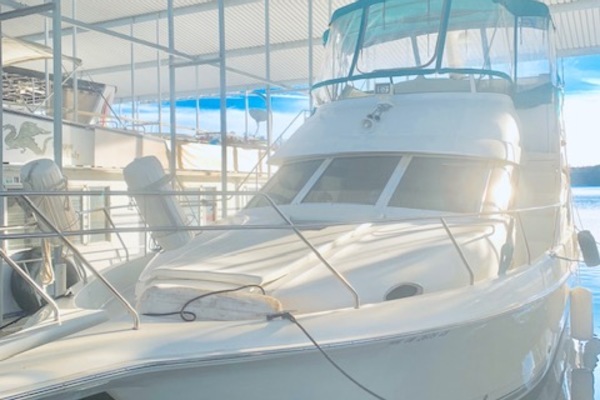 This yacht for sale is located in Fort Myers, Florida and priced at $149,000. For a showing please contact us by filling out the form on this page and we will get back to you shortly!